More and more municipalities are working for sustainable global development. And through the 2030 Agenda adopted by the United Nations in September 2015, municipal engagement in cooperation for development and sustainability is gaining further importance. The Service Agency Communities in One World supports municipalities in localizing the SDGs through awareness-raising activities, networking and for aligning their local plans to the SDGs (Aligning and Monitoring). We supply information on the options for getting involved in development work, advise on the formulation and implementation of municipal sustainability strategies, and provide forums for designing forward-looking action for results at the local level. We cooperate closely with actors from Germany's federal, regional and local governments, municipal associations and civil society organisations. Source: Outcome document of the United Nations Summit in New York on 18 September 2015. The 17 Sustainable Development Goals are linked directly and indirectly to the municipal administration level. 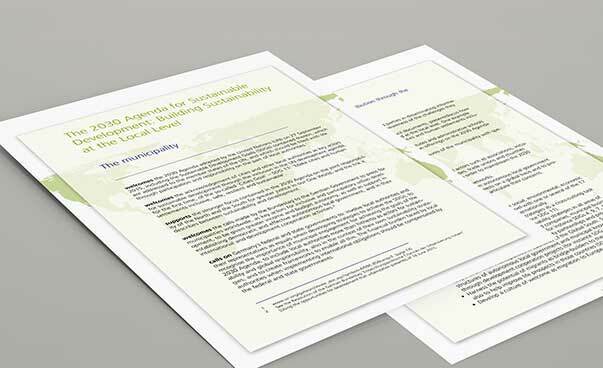 A collection of case studies illustrate how German municipalities contribute to the achievement of the SDGs and the Agenda 2030. We support german municipalities in producing their sustainability strategies and reports, and facilitate an intensive exchange of experiences through regular network meetings in exemplary projects in North Rhine-Westphalia and Thuringia. In Schleswig-Holstein we conduct workshops on the localization of SDGs at the local level. We support municipalities in Germany in holding information events, workshops/expert meetings, network meetings and conferences, and offer them professional and financial support. We offer suggestions and orientation through the preparation of studies and inventories in sustainability and development policy, as well as the implementation of the Agenda 2030. Sustainable development is crucial to the future viability of our planet. This basic idea runs throughout the 2030 Agenda for Sustainable Development. It is crucial that municipalities are involved in implementing the Agenda, because everything begins at the local level and is built on that. Specimen resolution: „The 2030 Agenda for Sustainable Development: Building Sustainability at the Local Level“. 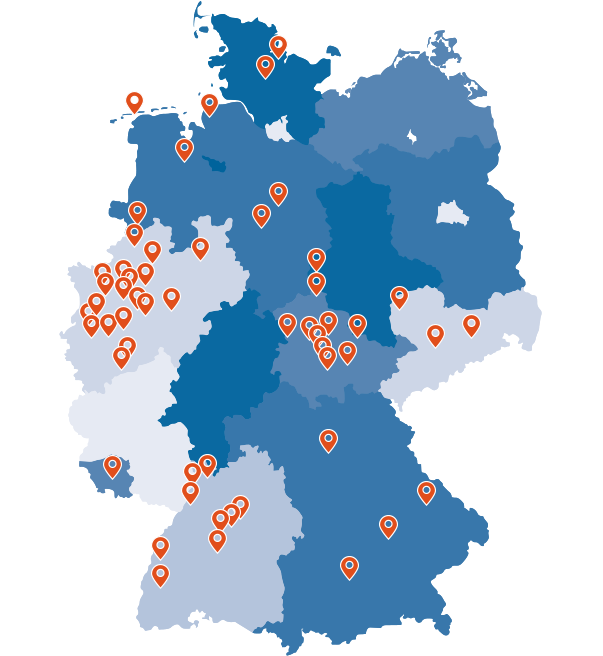 The map shows all the municipalities that have so far signed the specimen resolution of the Association of German Cities and the German Section of the Council of European Municipalities and Regions.